The Vancouver condo market appears to be going through it’s seasonal slowdown. The average sales price dipped to $875,177 after hitting an all time high of $908,468 last month. However, sales are still as strong as ever and inventory remains critically low. Let’s take a look at the numbers. 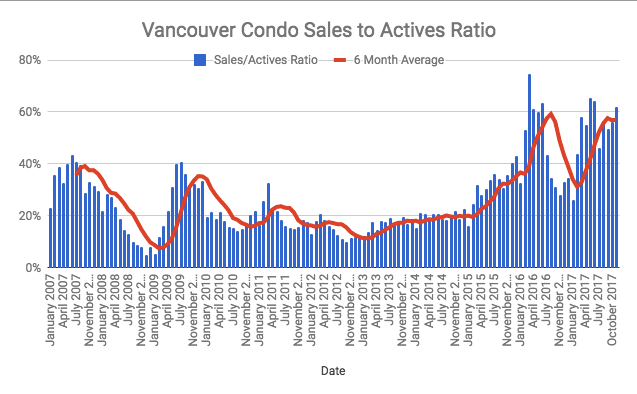 Vancouver condo sales increased 26% on a year over year basis and were 25% above the 10 year average for the month of November. This further highlights the huge shift in demand away from detached houses and into the condo market. There’s plenty of buyers for more affordable one bedroom condos and this seems to be where investors/ speculators are focusing. One thing worth noting is it appears “peak sales” are behind us. Peak sales were in March 2016, and after plummeting during the foreign buyers tax, eventually rebounded, and now appear to be levelling off. We shall see if this trend continues in the New Year. 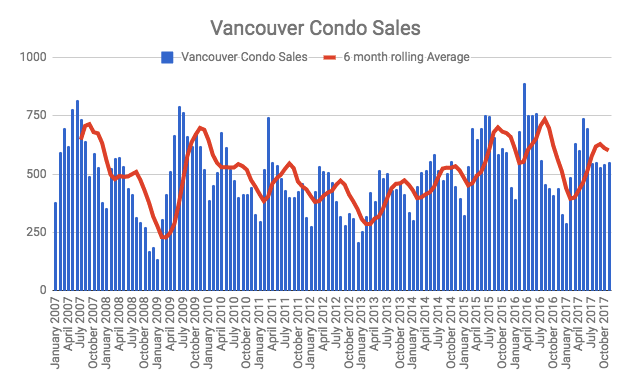 Vancouver Condo Sales including 6 month moving average. Vancouver condo new listings increased by 25% year over year and were 14% above the 10 year average. You’ll notice there was a huge purge of new listings last November. This was due to the shock of the foreign buyers tax as sellers held out. This is the problem when the Government interferes with the market, there are unintended consequences and you never know how people will react. This is why people in finance lobby for free markets, as there is a belief all markets are cyclical and will eventually self correct. Food for thought anyways. Total inventory levels fell to another new low, with just 896 units available for sale at the end of November. With a plethora of new construction nearing towards completion, I want to believe inventory levels can’t scrape much lower. We shall see. 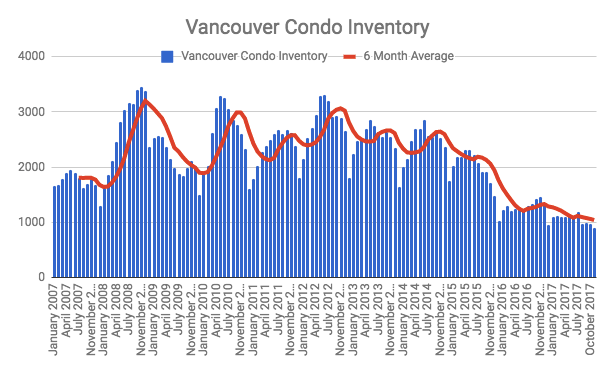 Vancouver Condo Inventory Levels with 6 month rolling average. The sales to actives ratio for November was 62%, up from 56% the month previous. Sales to Actives Ratio 62% in November, 2017. The average sales price of a Vancouver condo fell to $875,177 which was good for a 19.5% jump year over year. The median sales price was $707,000 a 19% increase year over year. The average price per square foot dropped to $1039. Down from Octobers $1047. This was the first decline in the average price per square foot in 11 months. It’s way too early to jump to conclusions but it feels like Vancouver condo prices are slowing. Price growth has slowed considerably, particularly at the higher price points. This is also evident in falling dollar volumes which I noted last week. I suspect sales will be strong in December as buyers scramble to get in prior to the new mortgage stress test in January.